I have talked about memories in other reviews that I have written, and it is fascinating the things you start to recollect when you begin contemplating that word. I remember this time when I played indoor soccer as the goalie. I will never forget how, during one match, I managed to kick the ball from our end into their net due to a super lucky bounce. I rarely scored (I was not very good) so such a rare occurrence combined with the manner in which it happened is something that will stick with me forever. There are also those not-so-happy memories; I remember my grandpa’s funeral, watching my mother and her siblings weeping for their father, with me, my brother, and my other cousins carrying the casket. It is one of the saddest moments I have ever experienced, with me still owning the cotton glove to this day. Soccer or family, happy or sad, memories are, as Plastic Memories somewhat depicts, a beautiful existence that should not be tossed aside but instead embraced for as long as humanly (and Giftia-ly) possible. 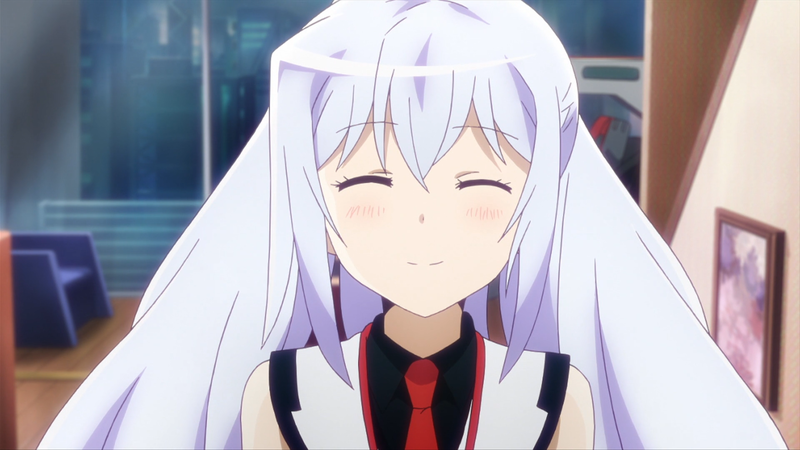 Plastic Memories follows young Tsukasa Mizugaki who has just recently transferred into a company that deals in the retrieval of “Giftias,” or cyborgs with human souls. Partnering with a clumsy Giftia known as Isla, the two’s relationship slowly blossoms. Plastic Memories manages to get off on the wrong foot from the very beginning due to apparent tonal issues. The tone of an anime or any other work is set in stone, with minor fluctuations throughout. For example, a comedy is designed to make the audience laugh, but that does not mean it must fully abstain from serious or less-than-light-hearted moments. Instead, it must make sure that it keeps the tone in mind and refrain from making egregious divergences from its initial path. Think of the tone like a slinky: it can bend, twist, and contort but when left alone it always goes back to its neutral state. For Plastic Memories, it takes the slinky and nearly breaks it. Very early on, the anime does not know what it really wants to be; one scenario has a tender moment between a grandmother and her grandchild only to have the next piece of dialogue revolve around potty humor. The next episode has intermittent joking that is not as jarring but the episode following becomes nothing but humor despite the drama surrounding it all. This problem is finally corrected by the fourth episode onward, so the tonal issues leave, but that kink in the slinky always remains and is therefore never forgotten. The show’s greatest strength lies in the events that take place. Essentially, every situation is designed for one of two purposes, sometimes both in unison: building the world and guiding the series towards the finale. This sounds very simple, perhaps mandatory for any tale, but it is how natural it all comes off as being that gives the narrative its edge. With each encounter, the anime does a nice job of providing the rules or foundation regarding the “Giftias” that have become commonplace. What a “Giftia” is, how they are used and taken care of, who they are, when certain problems arise because of them; situations like the Giftia who goes rogue or the Giftia who undergoes a reboot allow the audience to learn of the world and its workings through natural progression of the plot. Simultaneously, these same events indirectly push the narrative down the “path of no return” – namely, Isla’s death. The anime never outright claims how the show will end, but it does not have to, for the previously established rules indicate that her eventual passing is simply inevitable and irreversible. By doing this, the finale does not feel forced or cheap, leaving the viewer with a welcome sense of satisfaction. 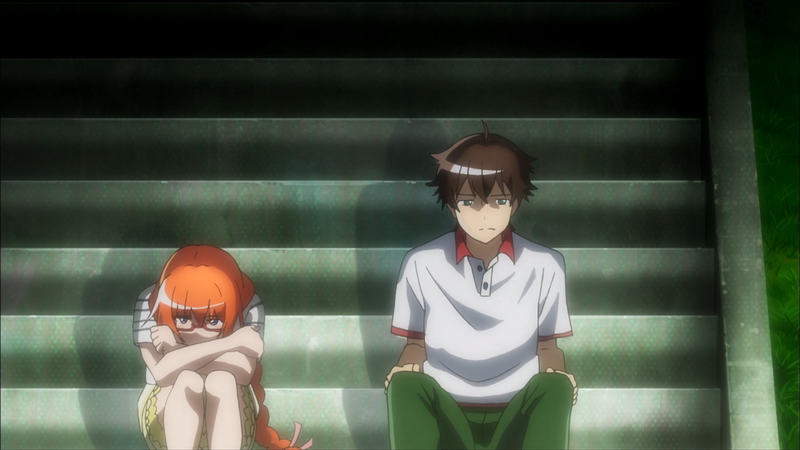 Throughout the drama, comedy, and world-building elements, the anime plays with its theme of memories. What is interesting is how the title plays into it all. An anime’s title is synonymous with the “face” of the show, meaning careful consideration is given to it. Here, calling the memories “plastic” might seem like a reference to the Giftias and their robotic status, but it is more profound than this. Plastic is a material that is not biodegradable; it fails to erode or fade no matter what happens to it, and the same can be said of memories. They last a lifetime, long after the moment passes, shaping a person’s life for the better. They occur in the past, are remembered in the present, and affect the future, giving them the power they hold. 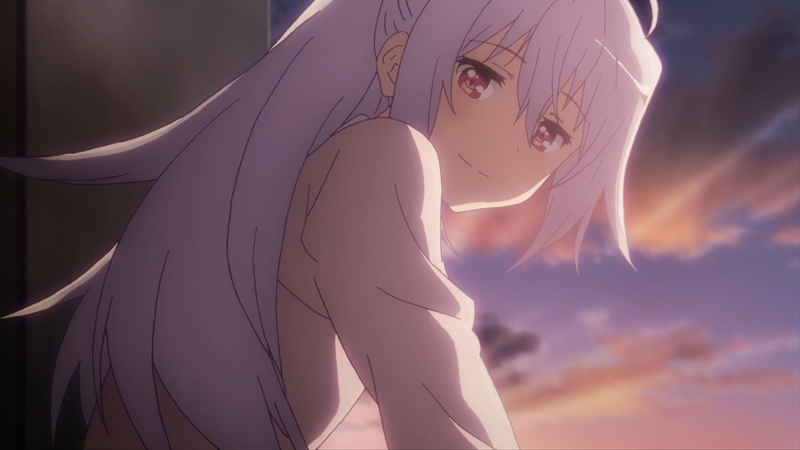 In Plastic Memories’ case, memories do the same; the show depicts recollections of previous happenings, provides new ones in the form of lap naps and a Ferris wheel, and preserves them in a tiny yet personable diary. The beginning bogs down this type of thinking due to being funny rather than serious, and by the end it is not immediately clear how everlasting memories are due to the romantic relationship that gains a lot of the focus, but the anime at least demonstrates how important such a concept truly is. 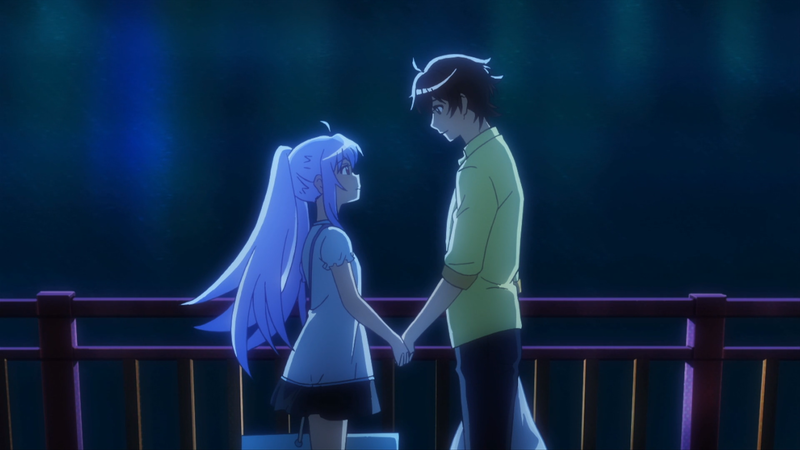 Plastic Memories takes place mostly at the on-site location where Tsukasa, Isla, and the rest work, as well as the dorm rooms that house them. However, the show does deviate from the norm by having the characters visit amusement parks, local cafes, shopping malls, movie theaters, and other parts of the main premises. The lighting is often appropriate, camera work is nothing special, and reaction faces are aplenty to fall in line with the reactionary comedy. As for the character designs, they are almost overly futuristic mostly due to the required white officer outfit they all wear to signify the position they hold in society. Other than their actual clothes, characters like Isla and Michiru retain cuteness and beauty, respectively, Kazuki’s flame-like bun matches her fiery personality, and Tsukasa, as is the case with most main characters, is as plain as plain can be. Overall, nothing spectacular is given, but they at least keep themselves from being overbearing or distracting. Actual animation is somewhere slightly above average. Despite the action that sometimes takes place, the show is normally filled with dialogue-heavy segments between the characters. 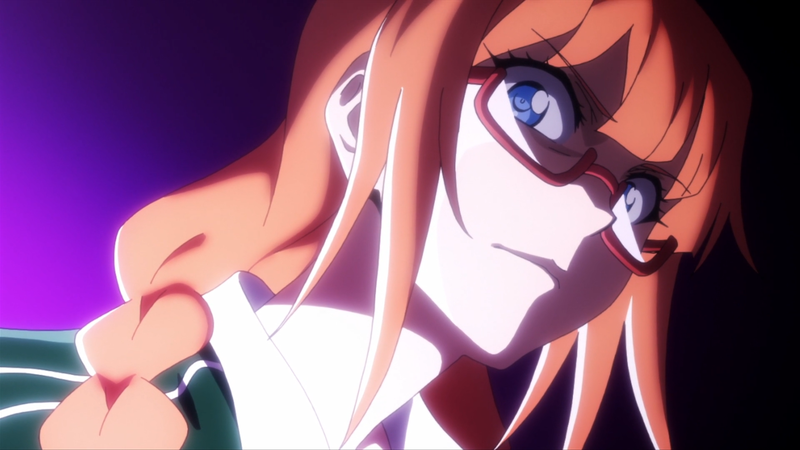 As such, the animation is not too extensive but there are moments – such as when Kazuki gets angry or Michiru becomes flustered – when it does pick up. They are infrequent, but even then, the show does a nice job of incorporating facial expressions, hair movements, and other subtleties to give movement where needed. The majority of the cast does not hold much of a place in the grander scheme of things. Yasutaka is a womanizer and Takao is a husband who has troubles being a father to his daughter, but both fail to affect the plot at large, as do the other side characters. At the minimum, Kazuki and Michiru have interconnecting pasts that provide the audience with the chance to not only learn more about the mysterious Giftias and how they are treated but also aid in revealing Isla’s past. Such memory investigation is contextually relevant and therefore more powerful in terms of the characters and their development. Considering her place in the anime, Isla is without a doubt the strongest character of the show. Initially, she is perceived as nothing but a klutz; she cannot perform basic on-site duties, she has difficulty socializing with others, and the only task she is truly capable of performing is watering plants and making tea. Over time, the viewer comes to understand that Isla, despite her weak abilities, cares deeply for the people around her, especially her fellow Giftias. But after experiencing so many scenarios and undergoing her own form of loss, she ironically comes to a rather depressing conclusion: that it would be best for her not to be remembered. She resigns herself to a fate worse than death, becoming a recluse to remove herself from everyone’s memories, for she feels that if she is forgotten than she can keep those close to her from ever getting hurt. It is not until Tsukasa comes into the fray, peeling back her shell and being there for her when others would not, that she finally begins to open. She comes to understand that memories are not meant to be painful; they are meant to be celebrated, to give those that live something fond to look back on, because memories stand the test of time. Her final conversation makes this wholly evident, where she reminisces with Tsukasa about the memories they have of each other, allowing her to move on in a moment that is beautifully poignant. As for Tsukasa, he is by no means a strong character but he does manage to bring about his own message. Not much is known of him early on besides the standard qualities: he is nice, he is hard working, and he is funny every once in a while. However, when he experiences the implications of a rogue Giftia, the audience sees how emotionally compromised he is. Outwardly, he always tries to be the upstanding dude, but inwardly, he goes through difficulties just as Isla and the others do. As he bids farewell to Isla the audience sees, for the first time, him putting forth his feelings without any reservations. It is a minor change in his person, but the time he had and the relationship he established with the girl of his dreams gave him the outlook he always needed: to cherish what one has now, for it could be gone before one knows it. The opening theme is quite strong when it first starts. The singing is soft and gentle, with a bout of strange sounds adding to the less-than-happy atmosphere. However, by the second half it loses its luster, becoming a conglomerate of noise that is not pleasing to the ears. The ending theme, similar to its OP counterpart, has an immediately good start with a catchy tune carrying it into the main portion. There, the piece becomes a mix of melancholy and happiness that fits the mood of the anime quite well. As the track ends, it takes on the same beat as how it started, making a whole package worth listening to. The rest of the soundtrack is largely forgettable, with the show using a typical set of tracks for the mood at hand. Some of the tracks utilize pianos and violins for the sad times, quirky sounds for the happy ones, and even English-heavy lyrical pieces for those very special occasions. The tracks are nothing grand or poor in execution, but none are worth caring for, either. Voice acting for Plastic Memories is somewhere around average. A special shout-out is deserved for Chinatsu Akasaki as Michiru for her defensive way of speaking. I hate goodbyes, despite knowing they are a part of our daily lives. I think this is why I bawled when it came to the ending; having to bid farewell to someone who is so cherished is something that really resonates with me emotionally. I was not even that attached to Isla as a character, but the concept and the situation had many tears streaming down my face as the finale was happening. If I get a bit more personal here, when I remember my grandfather’s funeral again, I have this distinct memory of me standing there, looking at the peaceful look he had on his face. I remember not crying, but shaking my head, almost unable to comprehend that this person, who I have known for so long, was now physically gone from this world. There were things I wanted to ask him, should have asked him, but never got the chance. But then I looked behind me at the monitor that had been set up, where the picture reel of the life he led was being played. Him at the cottage with his own kids, that one time at a restaurant where we celebrated his wedding anniversary; so many memories were flashing by – some that I experienced with him and some that I had not – that it was obvious how great a life he had. Today, at this moment, I realize now that he is not gone. He is in my heart, with the memories of him that I have being something that is truly eternal. I have this anime to thank for making me understand this simple fact that I should have known all along, and for that I will always be grateful. 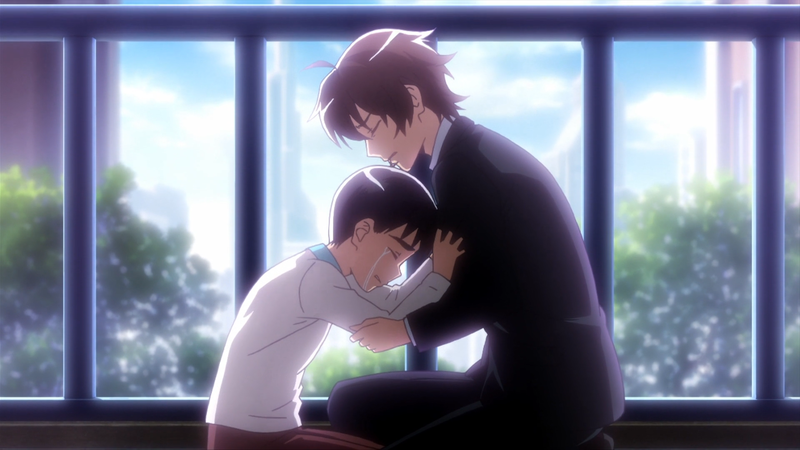 Plastic Memories is not the best when it comes to its art, its music, and even many of its characters. But the touching story it tells and the importance it places on memories is not only relatable but extremely sincere. Isla has moved on, but the memories of her will most certainly continue to exist in all of us.